I’ve never really been a huge cereal fan and bizarrely when growing up, it was more of a late night snack than an early morning starter. So for me, scrambling a couple of eggs before work has never seemed a chore nor particularly time consuming. For others however, Graham included, the simplicity of a couple of pieces of toast or a quick bowl of cereal is the overriding winner. BOOOO! So what is the best way to start you day? The words “a high protein breakfast” must have travelled across my lips a million times to patients. I am soon to be posting some of my favourite high-protein breakfasts, along with the reasons WHY, so if you’re interested in tackling those mid-morning energy slumps, losing weight and knowing that nutritionally you are smashing it in the morning, then be sure to sign up to my newsletter so you don’t miss out! For today though I would like to introduce this household favourite. As you know, I’m all about the DOs and CANs in health rather than the don’ts and can’ts. So if I tell you that most commercial cereals, even the supposedly 'healthy' ones, are highly processed and loaded with RUBBISH, but then offer a delicious and healthy granola recipe, I’m hoping you read between the lines and start substituting this ‘DO’ into your life. 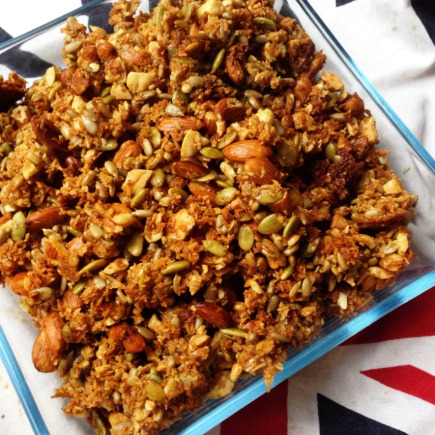 Protein rich, full of goodness and truly scrumptious, this paleo granola was the perfect pitch to overthrow Graham’s morning cereal. Line large baking tray with parchment/greaseproof paper. Throw cashews and almonds in a food processor and pulse a few times to chop the nuts into smaller pieces. Mix nuts, seeds and coconut in a big bowl then add cinnamon and nutmeg +/- salt, and stir to coat. Melt the honey and coconut oil on a low heat on the hob then add the vanilla. Pour the honey mix over the nuts and seeds, stir well to coat and then pour out onto the prepared baking sheet. Spread evenly. Bake for 30-35 minutes until golden. * It’s important nutritionally and flavour-wise to use raw, unsalted nuts and seeds, ideally 'activated'. ** I don’t like to add dried fruit to this as I don’t think it needs it, but if you’re not anti even more sugar, then stir the fruit into the mix as soon as out of the oven then allow to cool. *** For less sugar, you can reduce the honey content or omit it completely (my preferred way!). Upping the cinnamon can counteract the loss of sweetness. Is this my healthiest breakfast recommendation? Is this a far healthier alternative to most commercial cereals? ABSOLUTELY! No refined sugars, no preservatives, no extreme temperatures that obliterate nutritional value or produce nasty trans fats. Being so dense in nuts, seeds and coconut oil, it is loaded with protein and good, healthy, unsaturated fats, vitamins and minerals – all in all a great start to the day! I confess, as a classic ‘energy dipper’ I rarely eat this for breakfast, but as a sweet protein snack later in the day – it’s great to have in the cupboard! No need for milk, just grab a small handful and enjoy. I also totally understand that raw nuts and seeds are expensive. Personally, I invest in my food and my health willingly – above anything else in fact. If however you want a more affordable version, and aren’t fussy on what whole grains you eat, substitute 1-2 cups of nuts/seeds with oats. So there you go my fellow lobster chasers. Change up your morning movements with a healthy granola feast and feel good inside and out for doing it. YUM!